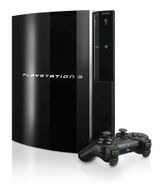 The PlayStation 3 (プレイステーション3) or PS3 is a video game console created by Sony as a successor to the PlayStation 2. It was released in late 2006 and competed in the seventh generation of video game consoles, primarily against the Xbox 360 and Wii. For the most part, the PlayStation 3 can be seen as an expected upgrade over the PlayStation 2, with superior technical specifications, online support, improved controllers and a more streamlined console design. It was released onto the market a full year after the Xbox 360, giving rivals Microsoft a head start, and was written off by many critics at the time for providing too little, too late. However, brand awareness and relatively strong lineup of exclusive games kept the PlayStation 3 afloat, and future cost-cutting measures and price drops caused the PlayStation 3 to become competitive once again. Though theoretically the more powerful console, PlayStation 3 games are seen as roughly on-par from a technical perspective to their Xbox 360 counterparts. The larger storage space of Sony's chosen storage media, Blu Ray discs can give the PlayStation 3 an edge, but the often cumbersome hardware often leads to slower and blurrier games than the Xbox 360 (although in some cases, the roles are reversed). For the most part, despite Sony's efforts to prove otherwise, the PlayStation 3 was considered to be an equal player in the seventh generation of consoles, receiving mostly the same games as the 360 with very few differences between the two versions. Similar to the PlayStation 2 before it, the PlayStation 3 became the de facto choice of console for Japanese developers, although with most of the major seventh generation titles being published by western companies such as Electronic Arts, Activision and Ubisoft, the impact was far less apparent than in prior generations. Though the PS3 continuously outsold the 360 in the Japanese market, the reverse was true in North America and the situation was split across Europe, meaning that the PlayStation 3 sold roughly the same amount of units as the 360 in the end (as oppsoed to the PlayStation 2, in which six times as many units were sold than Xbox consoles). Like many third-party publishers, Sega supported the Xbox 360 and PlayStation 3 in roughly equal measure. Games released for the Xbox 360 in its first year of service (i.e. before the PS3 was released) and the preference over Xbox Live Arcade over the PlayStation Network were balanced out by PlayStation-exclusive franchises such as the Yakuza series, which even led to Yakuza-branded PlayStation units. A situation quickly emerged in which all Xbox 360 games published by Sega would see a release on the PlayStation 3, usually on the same day. At a result it is difficult to know what Sega's opinions of the console were.